IT Infrastructure Solutions Provider Abacus Solutions and Bradford Networks join forces to offer live customer-centric webinars. The webinars will be hosted by Bradford customers who provide real-life perspective on the company’s network security solutions. Abacus Solutions, a leading provider of IT infrastructure solutions, and Bradford Networks, a leader in securing today’s heterogeneous networks, are teaming up to deliver a series of live webinars. These webinars feature a current Bradford customer, who will speak on their network challenges, and how they used the Bradford solutions to solve them. Last month, Abacus and Bradford kicked off their webinar series with the manager of Bridgestone’s credit card division, Tim Childress. Childress shared details on why their original Network Access Control (NAC) solution needed to be replaced, how he evaluated different solutions, why he chose Bradford, and the success he experienced with Bradford’s solution. At the end of the webinar, Childress answered questions from the audience, creating a truly interactive experience. In this month’s webinar, network professionals from the Medical University of South Carolina (MUSC) will describe the process they went through to select and implement a new network security solution. They will discuss their success with the Bradford solution, as well as their strategies for utilizing Bradford for future network security solutions. The webinar will be hosted on September 16, from 12-1pm EST. Network solutions make up part of the Abacus Solutions core competencies, and they formed a partnership with Bradford Networks in July of 2010. Bradford offers an industry-leading solution that secures critical IT assets and automates network security operations, making the partnership between the two companies a natural progression. “Bradford Networks offers some of the most powerful and innovative leading IT security solutions in the industry. We are excited about this new partnership and what it will bring to Abacus and our customers,” said Joe Thompson, Vice President of Channels and Marketing at Abacus Solutions. 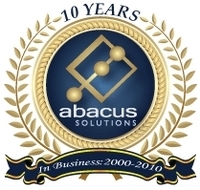 Abacus Solutions strategically combines products, services and resources to deliver IT infrastructure solutions that solve your business needs. The company architects multi-platform enterprise-level, server, storage and networking solutions by offering technologies from leading vendors. Products include servers, software, new and refurbished networking equipment and storage solutions. Whether new or expertly refurbished and warrantied equipment is needed, Abacus works directly with, and across, the purchasing and IT departments at both strategic and deep-dive technical levels to match the right equipment, budgets and processes to a company's direct needs -- delivering technology much faster than working directly with OEM vendors, at a fraction of the cost. For additional information, call 770-738-1101, 1-800-605-5446 or visit abacusllc.com.